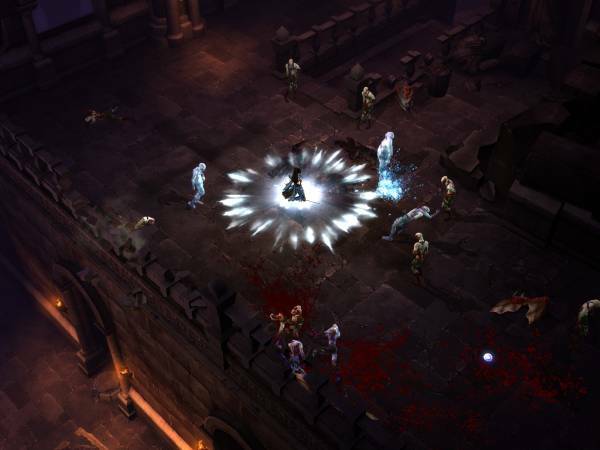 A fan objected to the potion-y sound of health orbs, and gave Bashiok a chance to remind everyone of a key fact about Diablo III at this point; it’s not done yet! I don’t believe any videos exist that show the health globes or play the sound they make when you pick them up as they exist now. The globes have a more gothicy-type look to them, sort of like a censer in a way? But with a big glowing red ball in the middle. And the sound they make when you pick them up is a more resonant “ka-thoonk”. When there’s a lot going on around your character it could be easy to lose sight of a health globe, so keeping them very visible is important. Also you want to know when you’re being healed so a prominent sound is very necessary. Most of the time there’s so much carnage going on, a monster could drop a globe on top of you and you wouldn’t even know you had picked it up if it weren’t for the sound. It all works really well, you’ll have to trust me. Elsewhere, someone unclear on the game lore and asked if the NPC crying, “What in the hells! ?” at the 10:05 point of the WWI gameplay movie was a misplaced plural. As Bashiok alludes to in his answer, the cosmology of Diablo specifies High Heavens and Burning Hells. Sancturians have a lot of hells. Finally, some sharp-eyed fan spotted a gleam of light in the lower right corner of this shot (caption freshly updated), and asked if it was an item. Winner! Correct. It is a dropped item. A wizard off-hand orb.